Courtesy Gokul K.R. From L to R Prathibha, Manoj, Satheesh, Koduri Kalyan, Justin, S.S.Rajamouli, M.M. Keeravani, Gokul K.R. Baahubali​ has been such an inspiring movie for me. In fact it was the only movie that I saw twice on the same day after Inception​. But I am a sound guy and I thought I would mention the little things I felt and noticed in the movie the second time around, because the first time I was just blown away. So, this is the Mix guy’s point of view. I have to admit I haven’t watched it in Atmos and I am sure its experience will be multifold. What I write is based on the Dolby 7.1 mix. The opening sequence is a beautifully mixed scene. From the beautiful lullaby to the way the song grows along with the amazing sequences on title. That was worth listening to. Handling water and waterfalls along with dialogues is a very difficult scene for any mix engineer. Its just because Water in so much width is exactly like white noise and has broadband spectrum leading to clashes. Juztin​’s take on it I would think is that once established, leave it to the visuals. Thats why when the score comes in and envelopes you, the water paves way to it. Once established, it also doesnt have to stay, thereby leaving us to have the experience of the space with the birds that call in between dialogues and the whisp of winds that fall in between. Once you leave that to reach Mahishmati, the ambience slowly gives way to winds and drier sounds. The way the songs were handled were also something that should be talked about. The Shivuni song had the vocals all around so as to give the presence of the Omnipresent one Shiva as a praise. As I felt, this was the key to the underlying score of Baahubali in terms of chords and also what should be expected in the film. The song rises and leaves you in that state of power. Following that the Dheervara song was another gem. Although personally I would have loved the Guitars a bit more on the chorus when I heard it first, I realised that by the end of the song, when it grows on you, this is exactly what was done! Add to that the rhythms in surrounds, where the usual notion of not having percussions in surrounds was broken. We did it before in Bombay Velvet when Justin did the songs and he did it again! No fear, just good sound. Once reaching Mahishmati, the way dialogues were handled were to be talked about. Very well balanced dialogue. But unfortunately, I wouldnt say the Telugu dub quality was upto the mark as it was distorted in many places. But here is how you distinguish a good mix. There still is the sense of the space, power and levels in it. That draws the line. The score placements were brilliantly done in the space. The surrounds were used mostly when the fronts were filled I felt. This gave a feel of wholeness to the mix. The Foley tones were really well done and a big mention to P.M. Satheesh for this. Him and Manoj M Goswami​ who were the designers on the film, assisted by Prathibha did a great job. The way the edits were done were also something that needs to be mentioned. Gokul Kr​ working on this for around 8 months or so simultaneously with Bombay Velvet, keeping in mind and focussing on the film is not a simple job and is no joke at all. Very impressed by the way the sounds were layered. Although as it went ahead towards the war, there could have been more space given. That may not be a singular fault as the lows may not have translated well in the theaters I saw. What ever is said, the rise and fall of the sound spectrum was beautiful. To give you another gem of an interpreted mix, the song Manohari has a tuned drum in the beginning. The pans of this that you will only hear in the theatrical mix is so beautiful that it interpreted the swaying after being intoxicated. This pan wont make sense if its on the cd without the visuals, The way the percussions were handled in this was also so good to go with the slight variations on the dance movements on screen. And each song is a master piece by Keeravani Sir. My only objection to having a song was the song Pachha Botesi between Shivudu and Avantika as it kind of broke the flow and I saw a lot of people suddenly looking into their phones or going off to the loo or simply shuffling in their seats. But that being said, the song that preceded it was a wonderful one in terms of visualising and the composition. Although a bit more perfection in terms of the physics of the composition would have been good. Talking more about the sound, the effects that were done during the first sword fight between Kattappa and the Persian trader was something that was really cool. Moving away from the cliched sword rings when ever there was an extended hold or a clash between the swords, it concentrated more on the weight of the sounds. The movements were also not with the ringy sounds that have been used so often after Hero was released. Post this the scene where Kattappa keeps Sivudu’s leg on his head with the monumental score and rain was just outstanding. I was literally on my feet looking at the interpretation of a man who didnt know who he was yet realises his strength. The very scene that preceded it was not gory as it could have been but became a mark of a stance taken by the character where he has no mercy to the unjust. What a way to show that! Here the rise of the score and the way it was played with was what made the impact. I have personally felt that nothing can move us the way music can. No amount of ambience design, effects, dialog foley can do what a string section can achieve. Kudos to the team in showing that. The little dialogue level variations and the perspectives handled in the movie along with the clever Low Pass during the war scene which would have otherwise easily become noisy and fatigued all show the effort to bring what is Baahubali. The Low pass was also something that was smart as it didn’t become cliched because of the way Baahubali’s dialogues were made to stand out even as the enemy kept approaching. Then taking a cue of a visual cut, the lowpass was opened to give way to the full spectrum of sound. This would not be complete without mentioning the language called Kiliki created for the Kalakeya tribes by Madhan Karky. The very nature of the language was raw and guttural although it did incite some laughs when the click sounds were made. Yet, when it was in the middle of the war, one could feel the rage and crudeness of the enemy that was attacking. I haven’t talked about the war tactics as you will find scores of reviews on how brilliant it was. I also haven’t covered the entirety of the sound design and mix as I feel it is only fitting the team themselves talk about it as it is their baby. 700 hours of Mix by Justin and Sarath assisting him over 40 odd days is no joke. Family, stress, home were all left behind for this. This is the story of every sound guy. Even the Dolby team of Bharath Reddy and Hareendra Nath Dwarak was so involved that they too spent an equal amount of effort getting the theaters set up and aligned along with creating the DCP masters. Honestly, it is not without its VFX rendering flaws, script flaws etc. Yet, its grandeur is big enough to cover all that. But reading this please also know that watching a pirated print or a low quality one on your phone or laptop will rob you of the sheer beauty the movie actually is. Its just like deciding to go on a family tour and you do it by clicking images on Google. It simply doesnt work and that isnt a tour! Stay Original! And as I said before, I bow to you Rajamouli Sir. I dont even want to imagine what comes in part 2 as I know I wont reach even 1/10th of your scale of thoughts! Nice review with attention to detail that most people would miss. Looking forward to more sound mix reviews from you. I got to watch this in a 7.1 screen with a good sub setup. I felt the lows could have been deeper and also the surrounds could have been used more aggressively But overall its a very good mix !! I liked the review very much which gives the insight of the sound details of the film. May be background, or a song or any sound, they are done very well. Just one observation I had regarding the music in the movie. when i heard the song in the album, it was very strong, thumping with the strong background music, but when the song started in the movie, I am not sure why, it went on more emotional way rather than strong (more of voice and very less music). I felt the same when i saw the movie for the 2nd time also. They want a more emotional touch to the scene and made it this way or any other reason I am not sure, but what you feel when you listen to the song in the album and what was in the theater was not the same. But i loved the audio, background music and very minute sound elements very much. Thanx again for the wonderful sound experience… !!! Hey Karthik, I will get Justin to answer this question for you. Justin is the mix engineer of the movie. Watched baahubali thrice. First time in a normal multiplex with 7.1 surround. Next watched in Dolby atmos in prasads hyderabad. Sound was better the 2nd time but I felt they didn’t use the dolby atmos that well. Felt noticeable difference only in the waterfall scene. I was not blown away by the dolby atmos sound like it happened with the movie Vishwaroopam. Vishwaroopam used auro 3d and the mixing was done in hollywood. Sounds in that movie felt so immersive that I felt all the action was happening in front of me. I was blown away with that sound. But I felt Baahubali didn’t use dolby atmos to its full potential. One good example is that before the movie starts, Prasads screens a short introduction about dolby atmos where they give us a small experience of how the sound would be. That was excellent and I thought I am going to experience the best sound once movie starts. But no. BGM and songs were great, but did not get the immersive effect. Dear Bhanu, thanks for the comment. Much appreciated. I won’t be able to comment on the atmos mic since I haven’t seen it myself. I do know that the 7.1 mix was derived from it. There is a marked difference between the way Vishwaroopam was mixed and Baahubali was done. One thing they have done in Bahubali is that the mix starts in 7.1 and goes to atmos. It was very close to Bombay Velvet although BV was more drastic in that it starts mono goes to 5.1 then 7.1 then atmos towards interval. This could be one reason why you didn’t feel it around you as I doubt that was the intention. Also one thing is that it wasn’t the overheads that was prominently used. But the pans across the speakers which made it very accurate. Again I am only speculating as I will only see the atmos version in 2 weeks. But thanks for the response. I will pass it on to the team as they are preparing a note on how the mix of bahubali was achieved. Thank you bro. Looking forward to your opinion on atmos sound mix review after 2 weeks. 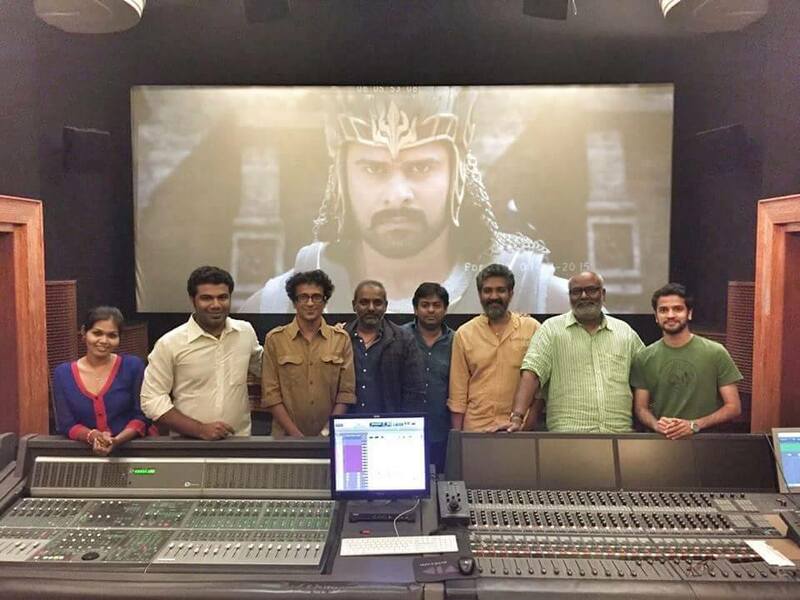 I hope the mixing team will give the best in Baahubali – The conclusion. Just felt that immersive sound in vishwaroopam was better. no issues. thanks again bro. ur blog is one of the very few that reviews sound in a movie. Keep it up.